3D slot developer Sheriff Gaming have been busy with their new releases of late, and one review that I wrote about recently on the site was for the leading developer's cartoon-themed Monsters Party. Taking its cue from the animated kids' film, Monsters Inc, we saw plenty of furry beasties and a fun take on the monster cartoon angle. Fellow developer Betsoft Gaming obviously want in on the act if their new game, Under the Bed, is anything to go by, seeing as it's packed to the gills with cutesy animation and top-notch graphics. 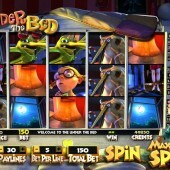 The 5-reel, 30-payline game from the leading rival 3D online slot developer sees you in the role of terrified brother and sister combo, Jane and Jesse, as they take on the various monsters living under their titular bed. This is Betsoft Gaming we're talking about, of course, so the great graphics, slick animation and Hollywood-style soundtrack are all present and correct. I still have issues with a rather child-friendly theme on an adult slot, but that's a discussion for another day. On the reels we get the brother and sister, of course, a bedside lamp, a moonlit night scene, the kids' parents who come in to see what all the noise is about, and an array of ghastly monsters who crop up in animated form on the screen occasionally while Jesse fights them off with a well-timed smack-down. 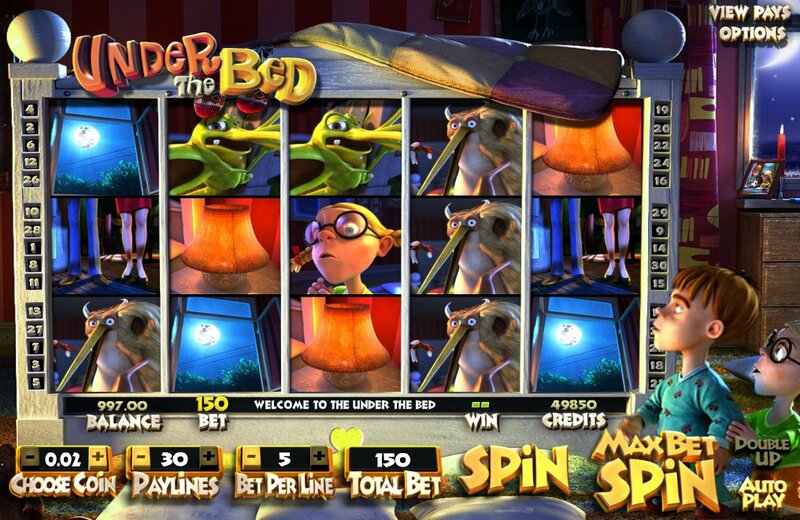 With new slots come new bonuses, of course, and Under the Bed has them in spades. First up is the Free Spins feature, triggered whenever three or more door icons are shown on the reels.12 freebies are up for grabs here. Boo! It's Some Sticky Wilds! The Long Lasting Wild, or 'Sticky Wild', is the game's best feature in our opinion. Substituting for all symbols other than the bonus scatters, simply get a paying combination of any monster with a special rim around, and the symbol reel will flip over showing a random number. This sticky Wild will remain in place for that number of times. I managed to get two Sticky Wilds on-screen at the same time, so it became pretty lucrative. Finally, three bed symbol scatters anywhere on the reels triggers a 'Pick the Card' bonus game. Simply turn over up to five monstrous cards one by one to reveal prizes. Keep choosing until you hit 'Collect'. With some neat animated touches and a great Wild feature, Betsoft are obviously up on their game as always. However, the aforementioned Monsters Party is another valid alternative, particularly with its progressive jackpot. Fans of Betsoft's top-class attention to detail may want to try out some of their other games. The noir-ish brilliance of After Night Falls would be a good starting point for a more adult theme.